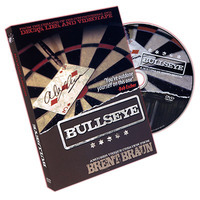 Today, when you order "Bullseye by Brent Braun - DVD", you'll instantly be emailed a Penguin Magic gift certificate. You can spend it on anything you like at Penguin, just like cash. Just complete your order as normal, and within seconds you'll get an email with your gift certificate. Reputation maker is a phrase you hear toss around a lot, but if you perform this at the right time around your friends or featured in your act. You will leave them astonished. It is the type of effect that for days, weeks, months and even years later people will still be talking about. I first saw this on David Blaine's special, Dive of Death and then had to wait a few months for it to finally be released on DVD. One of my favorite places to perform at is at my local pool hall, and I have always wanted to perform an effect using a dart board. So I finally received this and I was utterly amazed at the simplicity of this effect, and because of its simplicity it received screaming responses and people running all around the entire pool hall, much like the spectators David performed for. Even though I rarely, if ever repeat a trick twice in one day/night but I just had to perform this again because people at the bar heard all the commotion and even the cooks in the backroom came out and watched me perform the effect a second time. And I swear I thought the entire building was going to collapse from the sheer excitement of people running and screaming, grabbing at the darts, the signed card and even my deck! Two performances was enough that night, and I had to let the place cool down for a couple weeks before performing the effect again since I kept getting more and more requests to do it again. So anyone reading this and are still unsure if this effect will either fit your personal style or any other reason, I strongly suggest resisting the urge to pass this trick by, because almost everyone loves to play darts and to see a magician have a random spectator select a card, sign it and then toss the deck into the air and throw a dart through the cards and have it pinned to the dart board, will ALWAYS get the most insane reactions and the simplicity of this effect also increases the reactions from all the spectators who will watch you perform a truly amazing piece of card magic. So definitely add this to your cart and add it to your performance as well, and I can almost guarantee you will bring the house down with utterly insane reactions! BUY IT! This trick hits the mark (pun fully intended... in fact I thought long and hard about what to open this review with that would be relatively clever and sort of punny. But I digress, and I do digress quite well I might add). Anyhoo, you didn't have to read that last bit, after all, it was a parenthetical statement. So if you haven't hung up yet, you'll be glad you're still here. I know I'm rambling, and I haven't said anything about the trick yet, but in case you haven't noticed, I'm stalling hoping to get a bunch of people to stop reading out of boredom. See if people quit reading now, they'll never know how good this effect is, and they won't buy it, and I'll have it all to myself (insert your own "my precious" joke here). Alright, alright, I'll review it, otherwise Bryce at My Lovely Assistant will stop sending me stuff to review. So in a nutshell: Get this trick! First, the illusion is P.E.R.F.E.C.T! It absolutely looks like you threw the dart at the fluttering cards and pinned the selection. You truly only need a deck of cards and a dart and something to stick the dart in (like maybe the detached Ricky Jay head prop from the X-Files set). Spectator picks a card and signs it. The spectator shuffles the deck and hands it back to you. You spring the cards in the air and throw a dart through the fluttering cards. The dart pins the signed card to the dart board. No palming, no stooges, no switches. It really is the signed card on the dart board, and once the dart impales the card and is on the board, the spectator can remove it from the dart board. There are no duplicates and no switches. I know it sounds impossible, but it's not. Fork over the 30 bones and you'll see for yourself. As for the product quality itself, the lighting and sound are a little amateurish at times, but the navigation and the content covered are excellent. Brent covers every detail you can imagine for this effect. How to do it close up or on stage. How to do it with an assistant (not a stooge) or without. 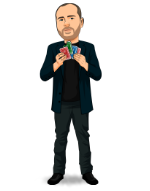 He tips a bunch of fun comedy bits you can throw (yes... I said "throw") into the routine, and so much more. I'm not a fan of one-trick DVDs usually, especially for $30.00 bucks. I'll make an exception if it's more that you're buying a prop that comes with an instructional DVD, as I mentioned in the Clutch review above. However, just one trick (no props, etc) for $30.00 bucks seems to be a bit over priced. However, there is always the argument that if you use the effect, it's worth the expense, and this is the kind of effect that can be a reputation maker for sure (unlike Clutch). I'm seriously considering adding this to my stand up act. It makes a "simple card trick" play huge and fills the stage. Highly recommended... lost a .5 point for price. GEM!